Castle Wedding venues are not so easy to find. Castle venues ON THE BEACH are even more difficult to find. At Noetzie in South Africa we can offer the best of both worlds. Imagine your own intimate fairy-tale beach wedding in a castle on the beach within a beautifully wild & pristine Nature Reserve. Noetzie castles offer just that! 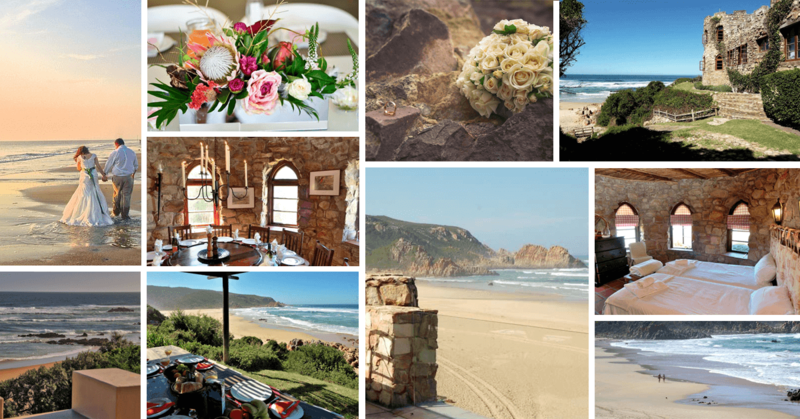 Located within the Noetzie conservancy near Knysna on The Garden Route are a number of castles on the beach used not only as holiday rentals but also as some of the best castle wedding venues South Africa’s Western Cape has to offer. Get married in a castle on the beach at Noetzie – it’s got that “WOW” factor! Situated along a pristine stretch of the Garden route these famous castles offer extraordinarily unusual wedding venue options. Not only does the architectural history of the castles provide for interesting discussion & added romance but the quiet, secluded beach is literally on the castles’ doorstep! These castle wedding venues offer the dream backdrop for your special day – made all the more memorable with authentic turrets, stone walls, crenellations, breathtaking sunsets and crashing waves to feature in your wedding photographs. Sinclair Nature Reserve also offers spectacular natural views, flora and fauna and lots of interesting outdoor pursuits for nature lovers. The areas immediately surrounding the Noetzie conservancy (& the quaint towns of Knysna & Plettenberg Bay) additionally offer plenty of adventure activity & things to do for your guests before and after the wedding. Of all South African wedding venues, the Noetzie castles are arguably one of the most unique and unusual options.